Patricia Carbajal started to break down as Univision announced that the Temporary Protected Status that has allowed her to reside in the United State legally for 19 years has been revoked. 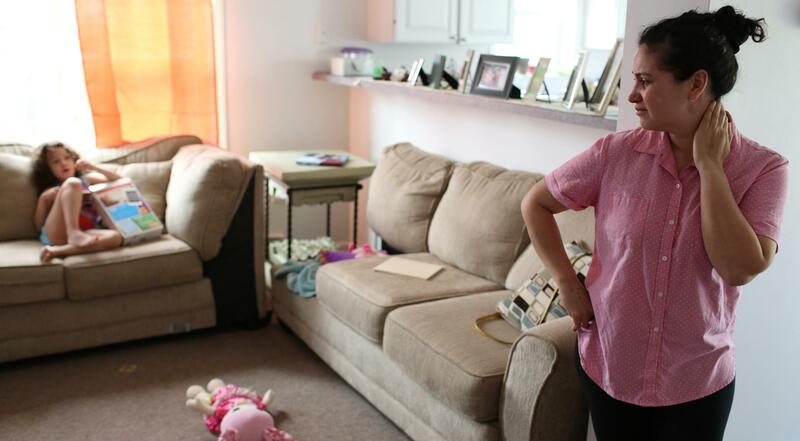 REVERE — In her three-bedroom duplex with a sloping backyard overlooking the rolling hills of the neighborhood, Patricia Carbajal thought about the life she’d worked so hard to build and everything that was now at risk. 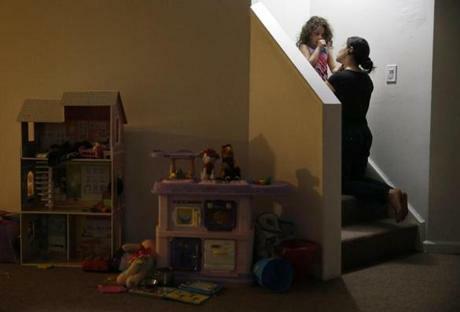 Curled up in her bed was her 4-year-old daughter, Camila, who wanted to snuggle. Downstairs was the television that Patricia wanted to be near. She was anxiously awaiting word on whether the Trump administration would cancel the program that has allowed her to live and work in the United States — a status given to her and tens of thousands of other Honduran immigrants nearly two decades ago, regardless of whether they had come to the United States legally. Patricia kissed Camila as she lay in the bed they share in their rented apartment. “Mami, I want to snuggle with you,” Camila said almost in a whisper. What she really had to do was listen to the news. And so, curled up for a few minutes more with Camila, she strained to hear the Univision report on the TV downstairs. So much was at stake. For 19 years, administration after administration had extended Temporary Protected Status for Hondurans after the destruction wrought by Hurricane Mitch in 1998 was compounded by crippling poverty, destabilizing corruption, and violence so pervasive that the murder rate in Honduras is now among the highest in the world. For 19 years, Republicans and Democrats had given Patricia and thousands like her permission to stay in this country, to work, to put down roots. After 19 years, Patricia’s status long ago stopped feeling temporary. But, now, with a word from Washington, everything could change. The Trump administration could cancel the program that had allowed her to create a life as a mother, a construction worker, a budding activist. Over seven months, she had watched as the federal government rescinded Temporary Protected Status for country after country, stripping the legal right to live and work in the United States from at least 250,000 people from Sudan. Nicaragua. Haiti. El Salvador. Nepal. Would Honduras be next? She hoped not. She prayed not. In the kitchen at last, Patricia busied herself making lunch, with Camila on a pink stool next to her, playfully running her fingers through the soaking white rice. After the rice and beans were on the stove, the onions and cilantro chopped, and the chicken seasoned, Univision’s Jorge Ramos appeared on the screen with the breaking news alert that Patricia had been waiting for. Running across the bottom of the screen were the words “Gobierno Anuncia Cancelación del TPS Para Hondureños.” It was what she had feared. Temporary Protected Status for Honduras had been canceled. “Mommy, why are you crying?” Camila asked. “I’m not crying,” Patricia said, trying to sound reassuring. 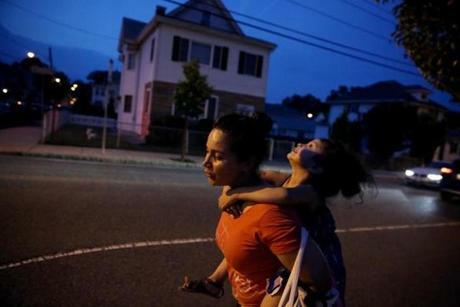 But 18 months to dismantle a life built over 19 years hardly seemed a fair trade to Patricia, who, at 39, has lived about half of her life in the United States. Now she stood in the kitchen, meticulously folding, unfolding, and refolding a wet paper towel, her hands trembling slightly. What now? At the end of 18 months, what then? Will immigration agents kick in her front door and drag her out in handcuffs? Will they come get her at work? If they do, what about her daughter? Who would care for her? They’d never spent a night apart. And if they were forced to return to Honduras, where will they live? How will she earn a living? In the United States, she’s been a nanny, a waitress, a maid, and now, a union construction worker. In Honduras, there would almost certainly be no work. As the end of the day drew near, Patricia carried Camila up the street that leads from the park back to their apartment. Patricia had grown up in a small farming community high in the mountains of Honduras near the border with Guatemala. Her village was awash in tropical foliage, with cattle ranches and fields of coffee, corn, and beans that cut through the emerald vegetation. Patricia was just 8 years old when her mother left for the United States, leaving five children to be raised by aunts and uncles and hoping to find a job that would allow her to support her family. The youngest was an 8-month-old whose four older siblings took turns waking in the middle of the night to feed her. A small bottle of water and formula sat by the bedside, waiting to be mixed when she cried. Her mother sent back whatever money she could, but it was never enough. So Patricia began collecting discarded coffee beans, selling them by the roadside. She began working in the fields full time when she finished ninth grade and her formal education ended. The village was safe, but it was also desperately poor. So she set her sights on the nearest city, San Pedro Sula, which was the industrial heart of Honduras and is now one of the country’s — and the world’s — most dangerous cities. The murder rate is about 15 times higher than Boston’s. She was 15, living in a boarding house and working in a factory sewing clips on bras. She earned just enough money to eat and pay rent but not enough to let her imagine a better future. Groups of teens roamed the streets, carrying knives to stab and rob people. One such mob chased her home one night. After that, she always returned before dark. Once, she watched in the marketplace as a boy ripped the earrings from a woman’s ears. The police, she recalled, shrugged and asked the woman why she would wear something that looked valuable in public. She should have known better. Patricia knew this was not a life. She longed for freedom, especially freedom from fear. After a full day of work, Patricia rested her head on the steering wheel for a moment after picking up Camila from the baby sitter. She had two choices: Stay, or leave and face the unknown. She decided, at 19, to take the risk and left Honduras. 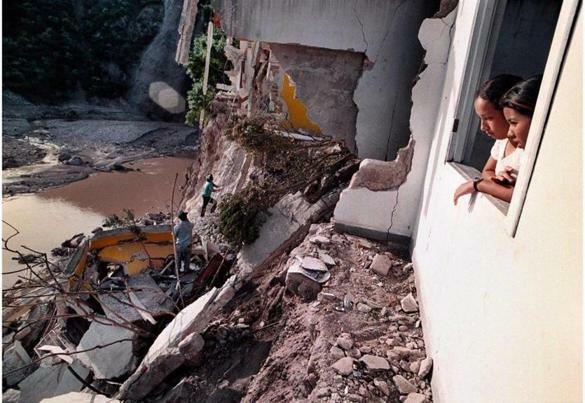 That was 1998 just before Hurricane Mitch killed more than 5,000 people and leveled much of Honduras’s infrastructure, setting the nation’s development back 50 years. 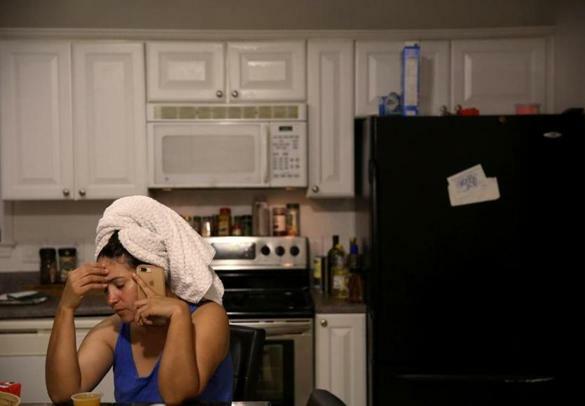 The next year, the US government granted Temporary Protected Status — a humanitarian designation that protects noncitizens from deportation when they are unable to return to their countries because of war or natural disaster — to 86,000 Hondurans living in the United States, a number that included Patricia, even though she had not been directly affected by the hurricane. The status, which must be applied for and approved, helped her to get a job and send money to family still in Honduras. She paid for a nephew to go to school, and like his aunt, the 18-year-old plans to move to San Pedro Sula. But the city, as with much of the country, is in many ways changed. The violence today is not perpetrated by roving gangs of juveniles with knives but by organized crime syndicates that regularly extort money from common citizens and businessmen. Patricia stood at the doorway keeping a watchful eye on Camila as she played with a neighbor’s child. “I feel like letting him go to San Pedro Sula is like killing him,” she said of her nephew, who has been offered a job there earning about 9,000 lempira — or about $375 US — a month. Patricia’s fears about returning to Honduras are reinforced by a steady stream of Facebook posts by human rights organizations, friends, and international and local media. There are videos of the police and military tear-gassing student protesters and gunmen robbing shopkeepers. News stories about parched fields withering in a drought because corrupt government officials took the money intended to pay for irrigation. There are pictures of unidentified corpses covered by sheets in fields and of a pastor who died after being attacked while he preached. She has been glued to her iPhone, obsessed with every development. She grabs it when she wakes in the middle of the night; she stares at it while Camila plays at the park. The posts tell her that a woman is killed in Honduras every 16 hours. The thought of her Camila, who was born in America, growing up in that world is more than she can bear. A day before the TPS decision came down, Patricia met with her lawyer Ivan Espinoza-Madrigal and discussed her fears about what will happen with TPS for Hondurans. She decided that if Trump cancels TPS, she will join Espinoza-Madrigal’s lawsuit, Centro Presente v. Trump, as a plaintiff challenging the termination of TPS. Patricia is fighting to make sure that doesn’t happen. She joined the immigrant advocacy group Centro Presente, finding camaraderie in her cause. She is a plaintiff in a federal lawsuit against the Trump administration filed by the Lawyers’ Committee for Civil Rights and Economic Justice on behalf of TPS holders from Honduras, Haiti, and El Salvador. 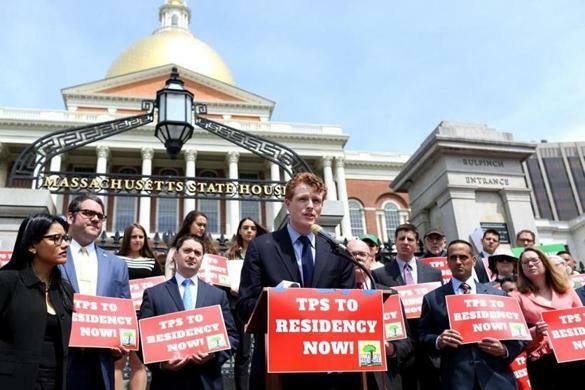 Their argument: Terminating TPS for these countries was an act of discrimination against immigrants of color. Their demand: To be allowed to remain legally in the United States. Already, a judge has ruled their case can proceed. Patricia bent down to kiss her daughter, Camila, as they took part in a rally at the State House held to protest the Trump administration’s decision to end TPS from Honduras. When Patricia took her turn at the microphone, she spoke to the crowd from the heart, telling them an abbreviated version of her story: That she is an immigrant here legally, not a criminal. That she is a single mother who works construction to provide for her daughter. That she loves this country. Temporary was also what it was supposed to be about. Part of the Immigration Act of 1990, a TPS designation was never intended to last forever and is not a pathway to permanent residency. When the humanitarian crisis that triggered the need for TPS is over – war ends, government stability returns, infrastructure is rebuilt – migrants are supposed to return home. But what happens when a country’s protected status is renewed over and over and people build new lives, starting careers here, buying homes, having children? 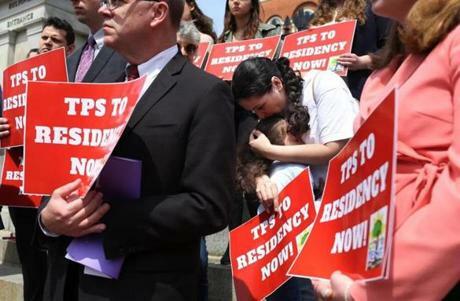 Congressional leaders and immigration experts began grappling with these questions soon after the 1990 act was passed, but the answer has eluded them. Camila ran ahead of her mom at Breakheart Reservation as the pair tried to balance on the painted line during a hike together. Eventually, it was Patricia’s turn to step to the microphone, Camila by her side, and speak. She had spent the weekend trying to figure out exactly what to say. 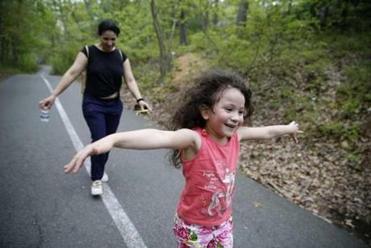 She and her cousin Glenda Espinoza talked about the rally during a trip to the park with Camila. Espinoza, a member of the custodial staff at Harvard University who has had protection under TPS for 18 years, didn’t really know what her cousin should tell the crowd. When Patricia took her turn at the microphone, she spoke from her heart, telling an abbreviated version of her story: that she is an immigrant here legally, not a criminal. That she is a single-mother who works construction to provide for her daughter. That she loves this country. Her powerful voice disguised the sorrow and insecurity she struggles to keep at bay. Despite her determination to stay, Patricia must also prepare to leave. She has begun to introduce Camila’s godmother into their daily routine little by little, hoping the additional time together will make the girl feel more secure should Patricia be detained by immigration authorities and Camila must be cared for by her godmother, who can also send Camila to Honduras if Patricia is deported. It’s a new routine that Camila, at times, resists. Her godmother lives nearby with her mother, who is affectionately called Tete. She considers them family. Besides, she is the only person Patricia knows and trusts whose immigration status is secure. “Mommy, I don’t want to go to Tete’s,” Camila whimpered on a sunny afternoon as the two play on the swing in a neighbor’s yard. But she must. Patricia has a meeting downtown with the Lawyers’ Committee to talk about adult things, even though it pains her to disrupt their playtime conversation. 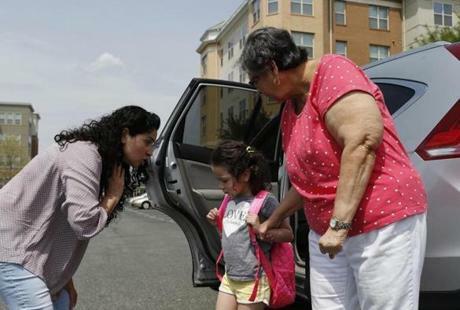 Patricia bent down to say goodbye to her daughter, Camila, as she dropped her off with her godmother’s mother, Tete, before a meeting with her lawyer. Tete has agreed to be the emergency caregiver for Camila in the event that Patricia is unexpectedly deported. If the worst were to happen, Tete would take Camila until they could find a way to reunite her with her mother in Honduras. “Promise me. Whatever Tete says, you have to listen,” she gently instructed. Patricia’s to-do list in the worst-case scenario seems to keep growing. She must make sure that Camila, an American citizen by birth, has dual citizenship with Honduras, renew her own Honduran passport, authorize a temporary caregiver for Camila, and make sure the pediatrician and school are in on the plan. But even a life in abeyance is filled with milestones and routine tasks, and in these moments — going to the grocery store, starting a college fund for Camila, registering the 4-year-old for pre-K — Patricia grounds herself, trying to find as much joy as possible, though worry is ever present. Camila expects certain familiar American rites of passage, like a school bus to take her to school. She pouted for a bit when her mother says that a bus for a child her age isn’t likely. But the little girl’s irritation is quickly forgotten as they enter Garfield School, where the school district’s early education office is located. “Look, mommy. My friends!” Camila squealed, waving at students walking through hallways lined with children’s artwork. Patricia beamed. She officially had a preschooler. Where did the time go? Camila skated toward her mom as she cheered her on at Revere Beach. “We’re going to go celebrate!” Patricia said, as her thoughts involuntarily turned to the many opportunities her daughter has in the United States that would be out of reach in Honduras. There, in 2013, children only attended school for seven and a half years on average. “Just thinking about it erases my whole happiness,” she said, trying to refocus on the here-and-now with Camila at the Public Garden, where they fed the ducks leftover bread from hot dogs bought from a street vendor. This was just the celebration Camila needed. She has been uneasy of late, and plagued by bad dreams. Patricia has trouble sleeping, too. Her mind races, thinking about what happens if she’s ordered out of the country. She will not leave Camila behind. The moments just after she puts her child to bed are the worst. The house is quiet save for a beeping smoke alarm in need of a battery change, and Patricia’s anxiety, fueled by what she calls “the ‘if’ in my life,” takes hold. When immigration agents began separating migrant children from their parents at the Southwest border, stories of parents being deported without their children ratcheted up her anxiety. “If that is happening now. What are they going to do to us when TPS ends?” she wondered. Work is one of the few places where Patricia can clear her mind of her worries, where she simply must focus on the task at hand. Doing excavation work, digging ditches, laying pipes, clearing debris might be grueling and dangerous, but earning $1,000 a week allows her to provide for her only child. A friend helped Patricia get her union construction job, which she started 15 days after giving birth. 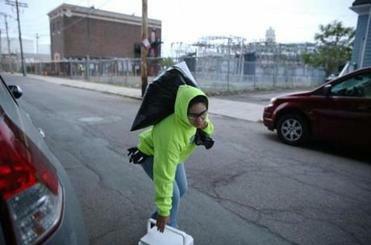 Patricia gathered her work gear and lunch as she made her way to the construction site where she works. Work is one of the few places where Patricia can clear her mind of her worries, where she simply must focus on the task at hand. “You have no idea how thankful I am because this job gives me everything I need,” she said. She works as much as she can, usually 10 hours a day, six days a week. But she recently had surgery and only worked eight-hour shifts five days a week while she healed. On her first day back after surgery, she was downstairs and dressed in a neon green hoodie with an American-flag patch sewed on the left shoulder at 4:11 a.m. The kettle warming on the stove had yet to whistle but the small pot of warm milk simmered as she stirred in quick oats. Her shift begins at 6 a.m., and it’s only a 10-minute drive to the baby sitter and another 10 minutes to the job site, but being late stresses Patricia out. So she dashed from stove to cupboard to refrigerator to couch, making breakfast, packing lunches. Finally, she sat down to enjoy a cup of coffee from a mug the size of a small bucket. The house was still, and the only sounds were the birds chirping loudly as the night sky faded to an early morning dark blue. “This is my time,” she whispered. It lasted all of five minutes. By 4:43 a.m., she had hoisted a sleeping Camila from the bed where the child was snoring softly, covered her in a fleece blanket, and slung her over her shoulder. She carried her daughter down the stairs and outside to the car. Pulling out of the driveway of the rented yellow duplex that she jokingly calls her “mansion,” Patricia felt grateful. Here, she has a life. Here, she is free. Here, she is home. Patricia kneeled down to face Camila on the stairs as she talked to her about the importance of being kind to others. Camila has been uneasy of late, and plagued by bad dreams. Patricia has trouble sleeping, too. Her mind races, thinking about what will happen if she’s ordered out of the country. She will not leave Camila behind. PHOTO GALLERY: A home, but for how long?